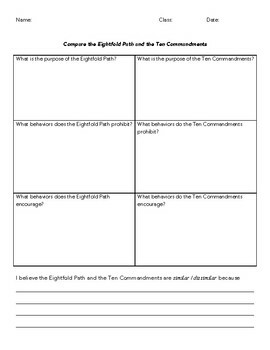 This worksheet is intended for a comparative religion unit of a world history class. It helps students compare the basic tenets of Buddhist philosophy with that of the Judeo-Christian philosophy. 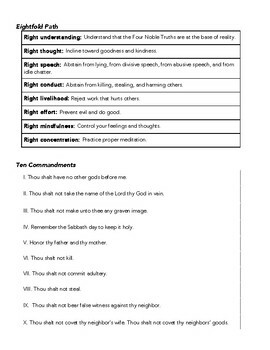 The worksheet can be used with descriptions of the Eightfold Path and Ten commandments from textbooks, or with the accompanying handout. This works well with small groups. It includes a higher-order thinking sentence starter. Differentiation is easily achieved by providing groups with more complex readings.